Patrick Meenan of AOL has released aggregated data results of a years data of web page testing from webpagetest.org. Comparing that to the web performance audit of the top 100 NZ websites. Looks like NZ homepages are starting to get the message. Homepage hall of shame – 1 year on…. I decided to have a look at “The NZ homepage hall of shame” , 1 year on. ( Part of the speeding up NZ Internet series, I’ve just finished retesting the web performance of top 75 NZ homepages and added another 25 websites to cover the departure of a few sites) . The bragging rights for NZ’s fastest webpage does not belong to Trade Me but to Land Transport at #1 and Canterbury University at #2. (Although Trade Me dominate the Top 10). The key takeaway from this audit is the effect of too many page elements will kill download speed. Reducing the number of page elements will speed up the site! 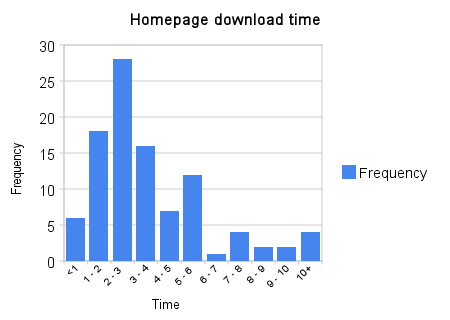 Here is a graph of the distribution of homepage download time. Wow, looking at the blog, we haven’t made any posts in months. Lots of changes happening, new staff, new office, lots of work! We’ve been busy on productionising some code, working with Gooddata and our new project with GWRC.